When you have agreed the sale of your property you thoughts turn towards the practicalities associated with the sale. At Hondon Valley Homes we arrange all this for you. We will transfer the existing water and electric contract into the new owners name at the date of completion. Your lawyer will handle the mortgage as they need to arrange with the banks to come to the notary to cancel the mortgage deed. Remember to cancel any life insurance policy attached to the mortgage as well, as many forget to do this. 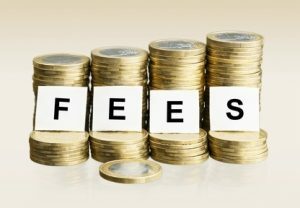 There could well be early redemption fees associated with cancelling a mortgage without running full term. Close your bank account as soon after completion as you can to avoid any withdrawals by the banks. It is also worth checking the status of your household insurance for buildings and contents. Is it paid annually or monthly. VENDORS: How long will it take to sell my home? Time from listing to the accepted offer. This depends on many factors. Your location, the condition of your property, the local competition, the specification of your property, your agents abilities and most importantly the price. If you are over ambitious on the price, you could be in for a long wait. Go on your agents website and look at the other properties similar to your. Are they cheaper and if so why? If you are expensive , then look at the other similarly priced properties and ask yourself if you would buy your villa or the others on price alone….. this is what potential buyers are doing. Time from an offer being accepted. If all your villa paperwork is fully in order then the time is determined by the speed of the lawyers. The buyers lawyer needs to be entirely satisfied that the property is free of debt or infraction and is safe for their clients to purchase. If your documentation is fully in order then there are fewer hurdles to combat. A normal completion takes between 4-6 weeks on urban properties like those in la Montañosa and 8-10 weeks on rustic properties, however it can be much shorter or longer depending on circumstances. If you have any special requirements regarding timeframe you must bring them to the attention of your lawyer and agent as soon as possible so that they can accommodate your requirements. VENDORS: What Paperwork Will I Need To Sell My Villa? So, You have made the decision to sell your home. When I come and see you I will have a list of questions to ask you and I will also ask to see your property documentation. In this FAQ we will help you prepare by letting you know exactly what we need in order to be able to list your property for sale. Please view the full article / blog we haver prepared for you on the link below, where we will explain each of the items in much greater detail. Please check out our blog and Two Minute Tuesday sections of the website or the FREE downloadable eBooks full of useful information for you. VENDORS: The costs associated with selling your villa. So you have decided to sell your dream home in the sun. Firstly we are going to take it for granted that your villa documentation is fully in order, you have all the correct licenses and permissions and your lawyer or agent has checked the documents and is satisfied that your property is in correct order to sell. It is important that you know the exact cost of selling as you need these figures when taking into account offers to purchase the property and the balance upon completion. We have a great video in our Two Minute Tuesday video Vlog section where Steven talks you through the costs associated with selling in much greater detail. 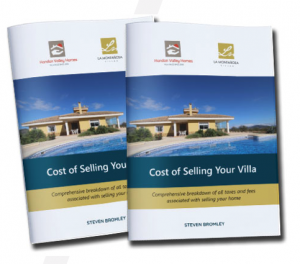 We also have a FREE eBook detailing fully the costs associated with selling your villa. Click on the book for more information. VENDORS - How do you know which agent to represent you? Avoid the pitfalls – get it right the first time. If there is one thing there is no shortage of in Spain it is real estate agents. When I started selling villas back in 2006 there were just two agents in my area. One established Spanish agent and myself. Now there are at least ten “agents” plying their trade in the same area. With varying degrees of success. So how do you go about choosing the correct agency to handle your purchase? We have produced a great video explaining the ins and outs of choosing your selling agent, what to look for and what questions to ask so you get it right the first time.